Books, Toys And Games Stay Organized All In One Place For Toddlers. Single-Sided, Birch Book Stand Features Easy-To-Reach Shelves To Display Favorite Books With Additional Storage Cubbies Below For Puzzles, Blocks And More. Maple Laminate With Colorful, Side Panels Is Easy To Clean And Stain-Resistant..
Books, Toys And Games Stay Organized All In One Place For Toddlers. 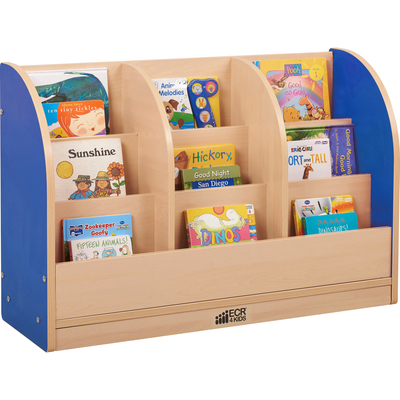 Single-Sided, Birch Book Stand Features Easy-To-Reach Shelves To Display Favorite Books With Additional Storage Cubbies Below For Puzzles, Blocks And More. Maple Laminate With Colorful, Side Panels Is Easy To Clean And Stain-Resistant.